Store in the fridge. If you aren’t using it straight away, you can store the milk in the freezer. If you are a Wash Farm customer, your milk comes from the Riverford Dairy. Guy’s brother Oliver and his sister Louise manage the herd of 270 dairy cows, which graze the farm in rotation with our organic veg. The cows also enjoy any vegetables that aren’t quite good enough for the vegboxes. Broccoli is a favourite! They have introduced Swiss alpine breeds into the herd such as Normande and Montbéliard, as they have found them better suited to the pasture-based system of organic dairy farming. 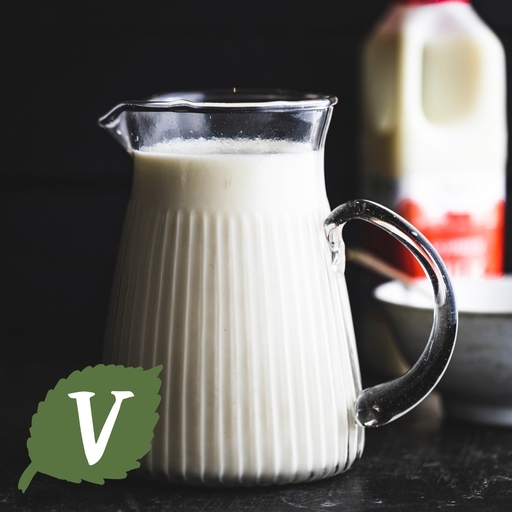 The Riverford Dairy does not homogenise the milk, so you will find a layer of cream on the top of the whole milk – either let the children race each other to the breakfast table for the cream, or shake the carton to disperse it. Fat content is always above 3.5%, but usually between 3.8% and 4.5%. If you are a Sacrewell or Home Farm customer, your milk comes from Acorn Dairy. Here, the Tweddle Family has farmed at Archdeacon Newton for four generations, since 1928. They began to deliver milk in the 1930s but like many small dairies were gradually pushed out by larger dairy businesses. They now sell directly to the end consumer, or through Riverford. Altogether the Tweddles have 250 cows at Garthorne Farm and 200 at Hallwith Farm, and manage a total of 680 acres. They are gradually changing the breed of cow they milk from a mix of British Friesian and Holstein towards the Dairy Shorthorn, which is better suited to producing milk from an organic system. The beautiful flavour of Acorn Dairy milk comes from the clover-rich diet the herds graze. Acorn Dairy homogenises its milk, as it has found that most of their customers prefer it that way.